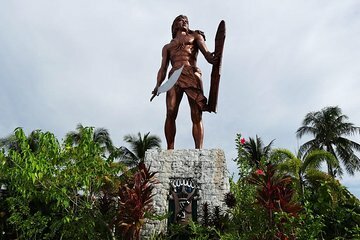 The tour is Ok, Some great landmarks around Cebu city and Mactan Island. The tour guide was great and very entertaining but the traffic and delays on the tour spoiled it. Our tour group was split up during a change to our bus after lunch, as a result we were left waiting around at different locations waiting for the group to join up again further delaying the tour. As we were staying at the Shangri La Mactan, we had to catch a taxi back to our hotel from Cebu city Tour does not provide transfers back to Mactan Island, drop off only in Cebu city We didn't get back to the hotel until 7pm. Way too late with kids. The tour guide Chen and her driver was great. She really knew her stuff and the city. She took great pictures for us as well. They managed our time efficiently allowing us ample time to enjoy all the tour sites and souvenir shops. We had so much fun in the jeepney driving from destination. We were even treated to Chen's great singing talent as she sang Whitney Houston during our tour! Highly recommended and would definitely choose them again with no hesitation. We spent a good full day. We started off at 930am. Be on the look out for ur guide at the lobby or inform the reception. We have enough time to do some shopping in the stalls in Mactan. We proceed for lunch at hotel. Then went for another half day. Reach my Mandarin hotel around 7pm. The guide was great. This tour came as a big surprise for us because my husband and I were the only guests. We really enjoyed the company of our driver and guide, we also gave them a birds-eye view of what was the city of Cebu in the past having lived and worked there years ago.